When you’ve gone from a 24-hr flu bug to a cold a few days later it is not that surprising to end up with sinusitis a week and a half later. That is where I found myself one Friday night, walking home in the freezing rain with a pulsing pain in my temples. 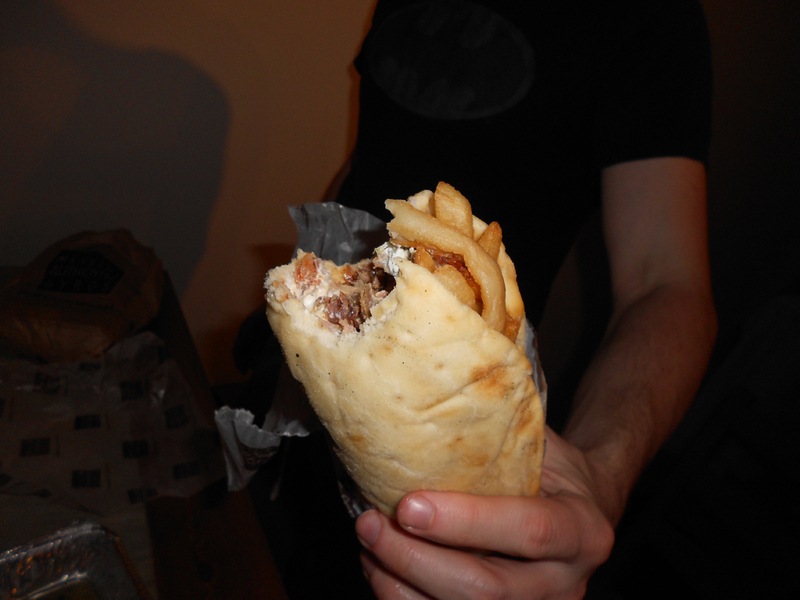 Brent had suggested we go out for best late night souvlaki and gyros/late night greek. I declined. There was no way I was leaving the house again. We settled down for a nice quiet night in, aptly playing Pandemic (while I held a hot pack to my head, just to add to it). Eventually Brent got hungry… that brave soul went out in the freezing rain to Messini’s. The food was amazing. I had ordered grilled octopus and a pork souvlaki. Brent, with eyes bigger than his stomach, ordered 3(!!!) pitas. The pitas were giant, the bread was so fluffy and light. For some reason they were stuffed with fries? It was a good addition. The real star was the grilled octopus, each bite was a little piece of greasy (it was smothered in olive oil) chewy heaven. As has become the tradition, we feasted while watching old episodes of The Simpsons, most notably the Mr. Plow episode. Waking up at 4:30am when you have a 4:45am wake-up alarm set is awful, there is no falling asleep. It is made all the worse if it is after a night of shouting, mild drinking and too much chocolate cake. It was an anxious wait for the cab, the suspense of would he find us was killing me. The flight back was pretty bad, I felt sick, still not having fully recovered from the flu. Because I had felt so horrible, I had not indulged in my daily cup of coffee so on top of the exhaustion I also had a caffeine-crash headache. Not exactly the best way to end a trip. And with that I have filled another travel notebook. I also learned that the resort life is not for me. Posted by kanysh on December 23, 2013 in Adventures of Pinka! Having spent the last few days either sick or on our feet, we opted for a lazy day at the resort. Maybe we were wrong in disliking resort life? Maybe it was really awesome? The morning was cloudy; we hid out in the house for a while, all reading. Brent and I headed to River Island for a day of fun, while Tasha & Greg went off on a mission to find a quiet place to read that was not playing Christmas music. We bought passes for River Island, allowing us unlimited mini-golf and tube rentals for the lazy river. It felt like a waste to buy a 3-day pass, but they did not have single day passes. 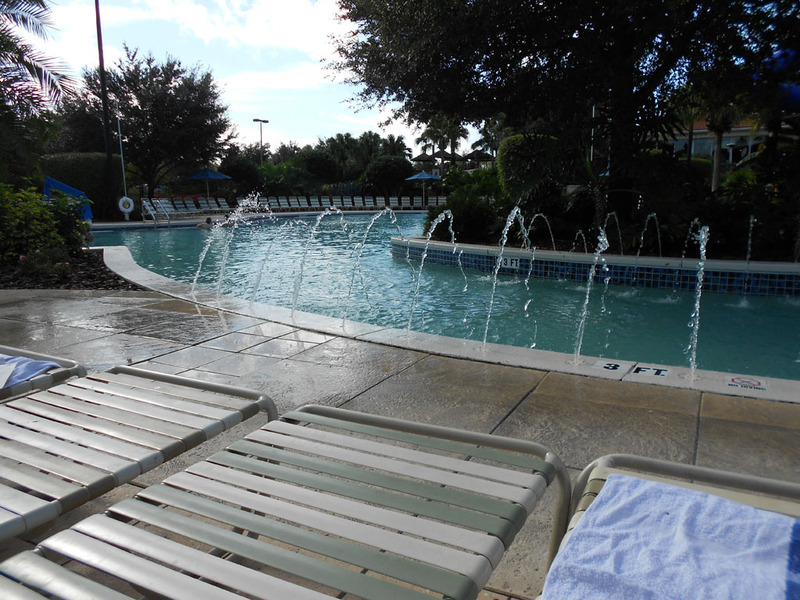 It was rather cold out (compared to the past few days), we decided to leave the lazy river for the afternoon. I was a bit rusty, having not played mini-golf for years. That was the excuse I gave myself for my poor performance, with an abysmal 20-swing hole. My total score was double Brent’s score (61 to 119). I did manage to get a hole in one though; I at least had that over Brent. The sun was starting to get stronger, it was hotter out and the UV was climbing: lacking sunscreen, we had to hide out indoors. We had been given 100 credits each to the arcade, which at first sounded like a lot… until the guy said it would get us 1-2 games. Apparently he had forgotten they had some old-school games in there for much cheaper (Ms. Pac Man and Donkey Kong). We had lunch at the only place that was open. I barely glanced at the menu; as soon as I saw “grilled cheese” my mind was set. There had been a girl yelling and the waitresses and some patrons all ran over, but it turned out she was just playing and did not actually need help. Having just eaten a large lunch, it seemed like a bad idea to go swimming. Thankfully there was a second mini-golf course on the island. We decided not to keep score this time. It figures that when we are not keeping score, I do amazing, getting a score of 3 on the first hole. We caught up to a family and rather than play past them, we decided to hang back and see who could get a hole-in-one first. It was fun but also frustrating. I managed to get 1; Brent beat me though, getting 2 hole-in-ones. There were some suspenseful misses. The sun had gotten much stronger and it was getting really hot outside. Plus the Christmas music playing on the golf course was really getting to me, it was louder than by the pool. We retreated to the lazy river, tubes in hand. It was too cold to float along the river, it was warmer to stay in the water and hold on to the tube, slowly floating along the river. It was fun bobbing around, desperately trying to avoid the water cannon and waterfalls. We passed by Greg & Tasha, who had the best seats on River Island, right beside the water spouts thus drowning out the Christmas music. We did not last very long in the river, bailing on it and running for the hot tubs. The Christmas music was really starting to get to me, alas we could not find Tasha & Greg so we walked back to the house, but not before stopping at the arcade so I could play skeeball. Once we had regrouped we decided to go to Applebee’s for dinner. We joked that we were old people given we were going for dinner so early; it was only 4 in the afternoon. I ordered the signature drink: apple sangria. What they did failed to mention was that it is served to you in a giant bowl with a stem, not a glass. It felt like I was drinking from a fishbowl. Brent and I had ordered pretzel bread sticks to share. They came with a disgusting amount of cheese on the side. Things only got worse from there. My Cajun steak was completely over-salted. We traded halfway, but the half-rack of ribs that Brent had ordered was bland. The meal only confirmed my feelings about Applebee’s: meh, it is just the American version of Jack Astor’s. I had been contemplating dessert at Applebee’s but I had a very specific craving for cookies which, for some reason, were not on the menu. The downside to staying in a resort that resembles a gated neighbourhood is that there are no vending machines nearby. It would be a half hour walk to the nearest shop and even then, I was not sure if they sold cookies there. Another downside is being unsure if a cab will be able to find you. We needed a cab the next day to take us to the airport at 5:00am. Brent called the front desk but they were just as unsure. We sat around the house awaiting trivia at the Legacy Sports Bar. I was not sure if it would be sports trivia or general and an internet search proved inconclusive. No one was paying attention during the team naming, therefore Brent just wrote down “Greg’s Team” on our ballot. We were up against 3 other teams, and there were prizes for 1rst, 2nd and 3rd places: we were confident we would do well. There was one team who were unstoppable, getting all but 1 question right. To be fair, they had twice as many people as other teams. About halfway through trivia one team had left, we were a shoe-in for at least 3rd, even the team that came in halfway would not be able to make up the points from the first half. There were a few upsets during the game, making things all the more fun. One question was “what is the capital of Canada”, we cheered and shouted. 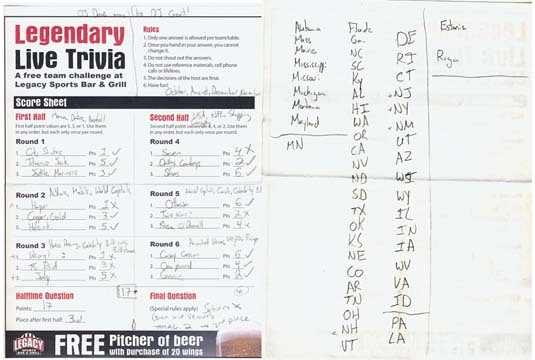 The trivia master said that a surprising amount of people get that one wrong and indeed half the teams did get it wrong. Another question was which month has the birthstone turquoise. Of the group I knew the most birthstones. I said December, but Brent insisted that his birthstone was white. I racked my brain, repeatedly questioning him. He was insistent. Tasha said it was a winter month. Brent and Greg said summer months. Again, I questioned Brent: how was he so certain? Finally I caved and said January, even though I still really thought it was December. What was the final answer after all that debating? It was December. I threw my arms up in frustration and went back to eating my Jack Daniels chocolate cake (which only half filled my cookie craving). We were always quick to answer so the trivia master would entertain us while the others debated. He showed us a magic trick wherein he turned a regular deck of cards all into 7 of clubs. We tried desperately to figure it out. Tasha knew, apparently she has training in magic tricks. Greg knew, someone had done the trick for them earlier in the week and Tasha had told him in confidence how it was done. We were so close to getting it out of Greg but he withheld. Arguably the biggest upset of the night was the final trivia question. Here you could bet all the points you had earned à la Final Jeopardy. The question was: which planet is the only one to spin counter-clockwise. We puzzled over it, all drawing blanks. Then Brent piped up with Venus. We questioned him; he said something about it being a little understood planet. Greg mentioned having read something about this recently. Greg also has a physics background; therefore it was much easier to believe him when he said Saturn. Plus Saturn has all those rings. Maybe I was also still recovering from the birthstone upset, but I sided with Greg, who already had Tasha on his side. I was not 100% sure though, I did not want to bet that many points. Greg insisted that we bet all of them. A compromise was reached and we bet 39 of our 41 points. The answer was revealed: it was Venus. Brent stood up and shouted, pointing to the original ballot that said Venus. It was easily the most hilarious upset of all time. We still managed to come in 2nd place. Our prize was a $10 gift voucher to any resort restaurant. Alas, it was not applicable to alcohol so we could not use it then. I was exhausted, all I could think of was sleep, it was only 9:30pm but we did have a 5:00am cab to catch in the morning. Nope. Resort life is not for Brent and I. As it turns out, going to be at 3 in the afternoon is a good way to ensure a super early wake up the next day. I was sore and sick of being in bed. It was only 8:00 (I had woken up at 7:30 and still tried to sleep, alas I was sore in all positions) and I figured everyone would still be asleep. Somehow I was still the last one out of bed. 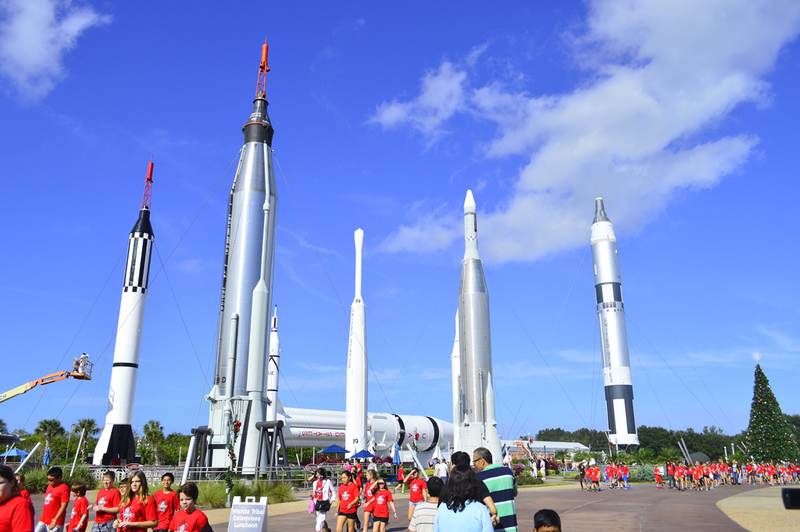 It was decided that after crepes for breakfast we would set out for the Kennedy Space Centre. We put all our faith in the GPS to guide us there. That is until we got to a neighbourhood service station and the GPS said we had arrived. Jokes ensued about seeing where the shuttles get serviced while we tried again with the GPS. This time we put in Cape Canaveral and we were on our way. The GPS assured us that we would be there in an hour. I am not sure that it took into account having to stop at a toll booth every few miles, it was ridiculous. I would have rather paid a higher toll at just one booth. After a while Brent noticed that two exits ago the signs for Kennedy Space Centre had stopped. We followed the GPS, taking the exit it suggested. We stopped at gas station and asked for directions; turns out we had to backtrack two exits. When we checked to see where the GPS was taking us, we found out it was taking us to Kennedy Camp Grounds. No more GPS, we were going to follow highway signs. Thankfully the gas station had a Dunkin’ Donuts so I too could fill up: on coffee and donuts. Given the season, I was drawn in by the red velvet latte and matching donut. While we were in the Dunkin’ Donuts there was a group of horribly annoying guys. One of them said to Tasha: looks like you dropped something. I was looking all around, mildly panicked, wondering what she could have possibly dropped. And then he said: your smile. No reaction whatsoever from Tasha, nothing but laughter from the guy’s friend: if only that were the end of it. His friend commented that he had not done it right, and proceeded to demonstrate how it is done… and used the exact same line on Tasha again. Of course more laughter ensued as he too got shut out. Another from the group piped up that they were both saying it wrong. “I hope we weren’t annoying,” one of them said to us on our way out. Back on the highway we finally saw some signs for Kennedy Space Centre, we were back on track! It felt like we were really close once we took the right exit. What I had forgotten to account for was driving all the way out, given it was located on a little tiny peninsula, as in far away from everything. On the way we saw a gator in the canal running parallel to the road. As it turns out, the land around the Kennedy Space Centre is a nature reserve, which explains that photo of a frog getting blown sky-high during a rocket launch. We started our day in the rocket garden which is exactly what it sounds like: winding paths with rockets interspersed throughout flowerbeds, complete with little info boards. We looked at maybe two rockets before seeking shelter from the noonday sun in the History of Space Exploration exhibit. 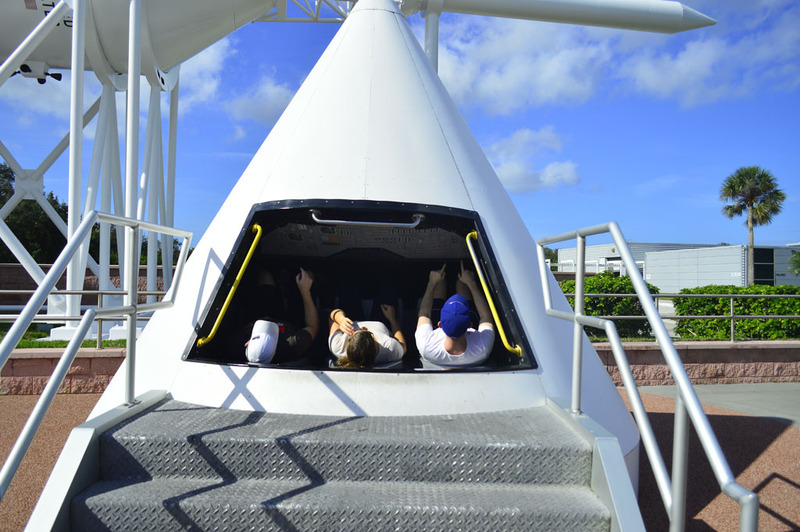 Back outside in the rocket garden they have a Gemini capsule you could climb into. I did not enjoy it, it was cramped and tiny and only added on to the list of reasons why I will never be an astronaut. The Angry Birds in Space exhibit seemed unrelated and I learned nothing there. There was a laser maze you could go through, wherein you had to jump over and crawl under lasers. There was a camera inside; we could watch Brent and then Greg attempt the maze. The results were hilarious. Alas, the supervisor came over and Tasha did not get a chance, turns out it was meant only for kids. We stopped at the Orbit Café for lunch. It was absolutely horrid. My chicken tenders tasted like peanuts. I watched them make Brent’s chicken sandwich, as she pulled the pre-cooked chicken breast out of the warmer, it was soaking wet and dripping: that is not right. After lunch we went on the bus tour. 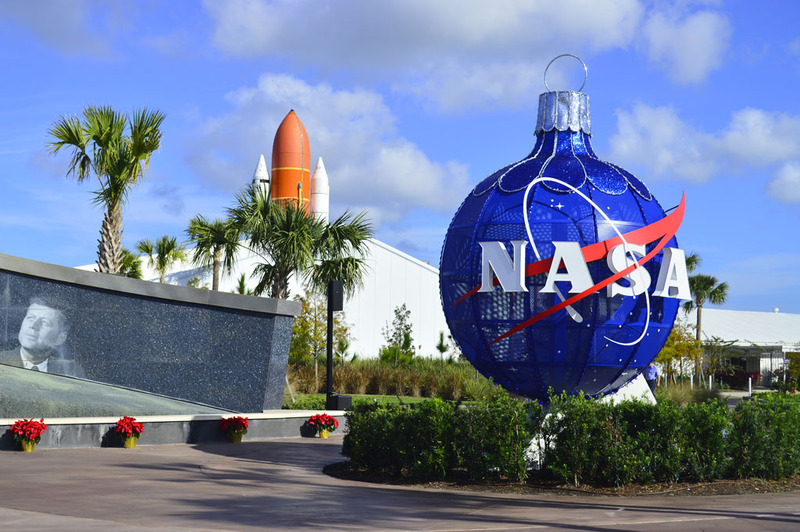 Up until then it had seemed that Kennedy Space Centre was a bit of a rip-off, so expensive and so few things to see (rocket garden, history of space flight, Angry Birds and the one building, Atlantis, we had not gone to yet). It all seemed like stuff that could be set up anywhere. The bus was taking us to an exhibit on the Saturn V rockets, but instead of going straight there, we took the scenic route. 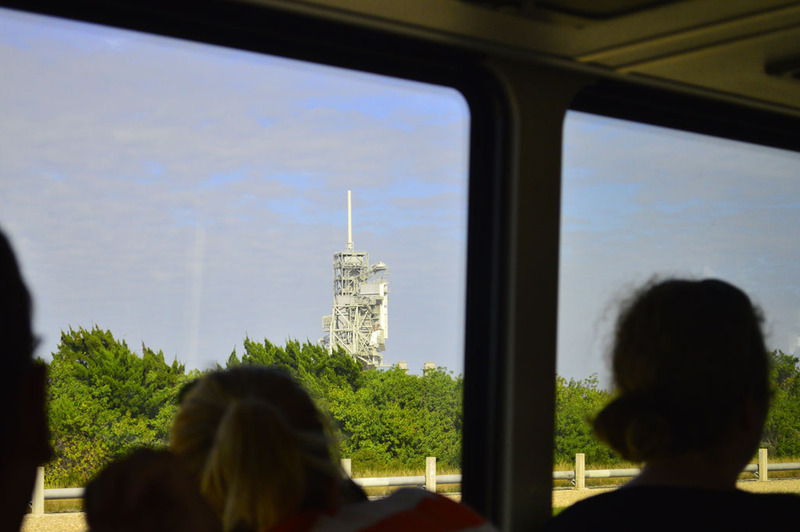 We got to see launch pads, bases, the Vehicular Assembly Building (i.e. : where they build the rockets). 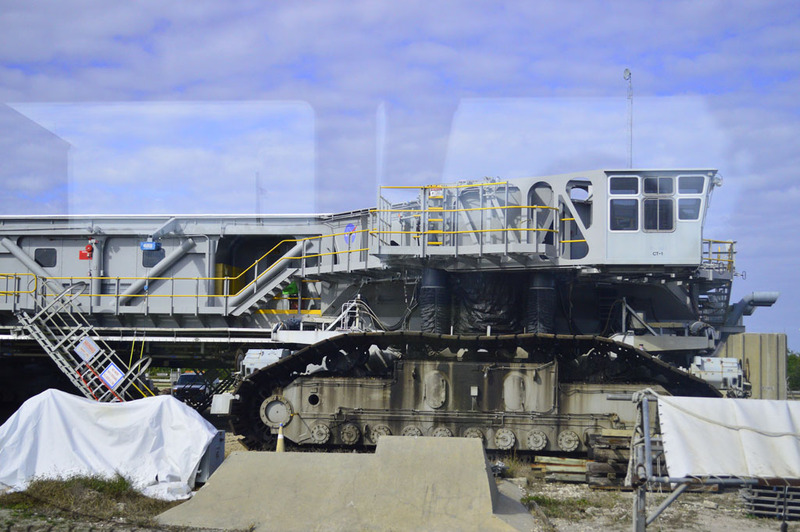 One of the coolest things was getting to see a Crawler, as in what they use to get the rockets from the Vehicular Assembly Building TO the actual launch pad. 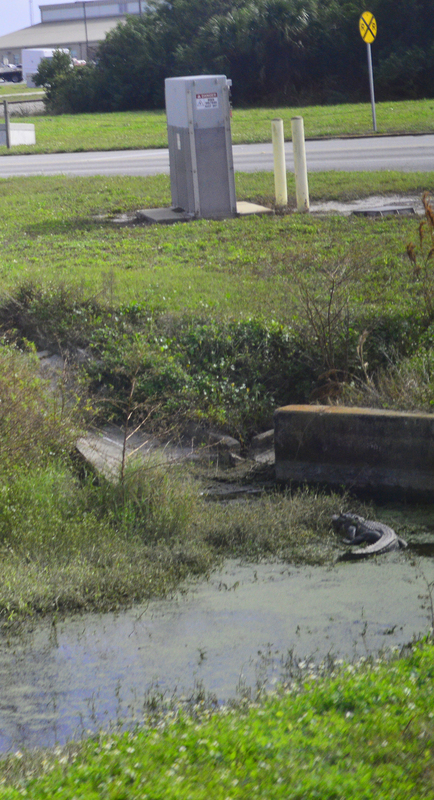 Along the way we also saw some more alligators hanging out in canals. We were dropped off at the Saturn V Rocket Centre and left standing there. It was a long boring wait, but finally we were let in. 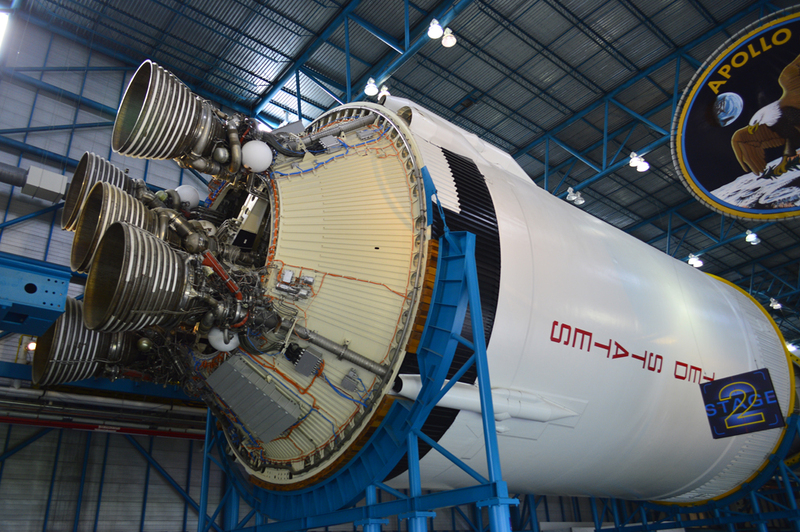 We stood in a giant room and watched a video about the creation of the Saturn V rocket, it was tacky and horrible. 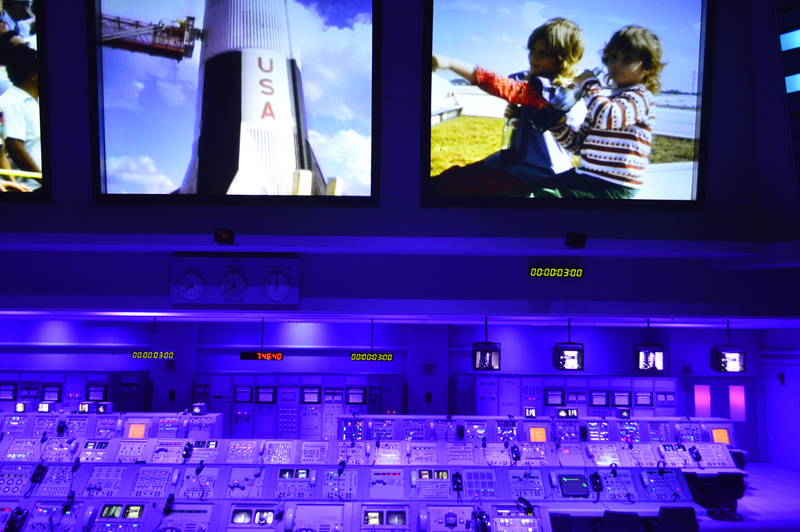 From there the doors opened into a small auditorium, at the front of which they had set up the actual control room from the Saturn V launch to the moon. On the screen they played clips from the actual launch, both raw footage of NASA people running about and people watching the launch. When the footage of the launch played, the whole auditorium shook so as to add a sense of realism. Another set of doors opened and there, suspended from the ceiling on its side was the Saturn V rocket in all its giant glory. I cannot state how enormous it was, for comparison: I am guessing it would not fit in an airplane hangar. I got to touch more moon rock, this time it was basalt which is naturally smooth unlike the rock in the Smithsonian which was smoothed over time with wear. They had on display the Kitty Hawk capsule from the Apollo 14 mission, it had been to space and back: you could tell, compared to all the other stuff on display. It was no longer silver, having taken on a tarnished brown colour. The only space food they had in the gift shop was astronaut ice cream. I had been hoping to buy as souvenirs some food in a tube or something really wacky. The bus ride back was much shorter, as we drove directly back. Along the way in the canal there were what appeared to be flamingoes (in the Nature &Technology building we would later learn that they were roseate spoonbills). In the Atlantis building we had to go up a ramp, around a corner and up another ramp. There was so much anticipation building… only to be faced with a barrier and a sign saying we had to wait 7 minutes for the next showing. I was concerned that this was the wait for the shuttle launch simulation, which I had every intention of sitting out. Turns out it was a movie about Atlantis. The movie continued in a second room, except this time it played on all the walls and the ceiling, making me really dizzy. It was supposed to make us feel like we were aboard the Atlantis shuttle. The doors opened and there in front us was the Atlantis shuttle, complete with a Canadarm (of which there are apparently multiples, not just one as I had previously thought). There was more age discrimination as we tried to take the slide down to the next floor, it was at the angle of re-entry, but you had to be under 12 years old. On the lower floor of the exhibit, down below the shuttle, there were various simulations you could test out. I tried to land a shuttle but it only made me really dizzy and I crashed, further proving what a lousy astronaut I would make. I sat out for the shuttle launch exhibition, as I was still not feeling 100% better after the flu. We were so close to being done; we had only 3 exhibits left! The Hubble Space telescope exhibit sucked, we were expecting gorgeous colour photos, but there were only a few. It was mostly little info bubbles about it intended for people who were waiting around to be let in for the IMAX films. I was tempted by the movie theatre popcorn, so I stayed behind while they went to the robot exhibit. I had to settle for Cracker Jacks because the popcorn was only available in giant tubs. Apparently I had only missed Greg getting hugged by a robot; the rest of the exhibit was boring. I was about to ask Brent if he knew that the astronaut posted outside the exhibit was in fact a person in costume, until I saw out of the corner of my eye that the astronaut was following him. The Nature & Tech exhibit was really boring and unrelated; it was about the wildlife in the nature reserve part. We were all very tired and ready to leave. For dinner, Brent and I went to the sports bar. I was craving greasy, garlicky chicken wings: the perfect dinner for a sore throat. I had brought along my souvenir cup, but the bar tender made way too much margarita and I ended up with an extra half cup on the side. The best part of the day, no matter what Greg says, was the bus ride. Posted by kanysh on December 22, 2013 in Adventures of Pinka! Brent had caught a 24-hour flu bug and was out for the day. We decided to have a lazy day on the resort, that way I could pop by and check on Brent periodically throughout the day. My throat was sore from the past two days of screaming, I was looking forward to a quiet day of reading by the pool on River Island. So much for quiet, they were blasting Christmas music on a loop. It was bad; we had to set up camp by some water jets to drown out the noise. Once I finally settled into my lounge chair, coffee and book in hand, it was fine. Until around noon when it got boiling hot, I took a quick dip in the river and soaked my head. Back in my lounge chair it was nice to be shivering and cold, but that did not last very long. We retreated back to the house for lunch and to check on Brent. We researched swimming with the manatees and Greg called to find out more. Alas he found out that it had been so unseasonably warm that the manatees were staying further out in the ocean, there were very few manatee sightings. It was not worth it to get up at 4:30am and risk a few hours in a boat with no sightings. Back at the pool I was exhausted, I could not even stay awake to read. I managed to fall asleep despite the Christmas music. I woke up and in a paranoid daze went off in search of anti-getting-sick supplies. I was not going to let the inevitable flu wallop me! I stocked up on orange juice, Halls and dissolvable vitamin C/immune boosting tablets. I took it one step further and dissolved the tablet in my orange juice. I ended up falling asleep again, so much for reading. After 2 naps I was still tired and raccoon-eyed. The only thing cheering me up was watching people get sprayed with the water cannon while they floated by in the lazy river. No matter how hard I tried to fight it and deny it: the flu was after me. I did not go out again with Tasha & Greg, who went back to Universal Studios. I took to the couch and slept for 3 hours, alas it made my back hurt. I figured if I was sick already, then sleeping in the same room as Brent would no longer be a danger to me. I did not sleep well however, it was fitful but I avoided the worst of the flu. All I got were a few aches and half a day lost. Victory!!! Posted by kanysh on December 19, 2013 in 1000th post, Adventures of Pinka! Barely out of bed, and we were already out the door to guest services. Greg had gotten a good deal on tickets to Universal Studios and we had no time to waste. To get the tickets we had to walk by where all the time share deals are signed, we were there early enough in the morning that there was still some food out. We swiped a few donuts (if you believe in karma, it got us, they were gross) and oranges which I like to believe came from an orange tree nearby. Bad donuts and oranges make for a lousy breakfast; we stopped at McDonald’s to grab some food. Alas, they did not have muffins (it might be more widespread than I had initially thought, even though everyone in the car argued against me). I had a bite of Brent’s southwestern chicken biscuit, it only confirmed my hatred of southern biscuits, they’re weirdly mealy and chewy and just gross- at least the McDonald’s one is. We got to Universal Studios around 11 and had to wait in line to redeem our vouchers for actual tickets. There was a giant group of at least seven people holding the line-up, debating God only knows what. I was really anxious to get to the park. Thankfully once we got our tickets the crowd thinned out. We started with the Despicable Me ride partly because it was the first one we saw upon entering. 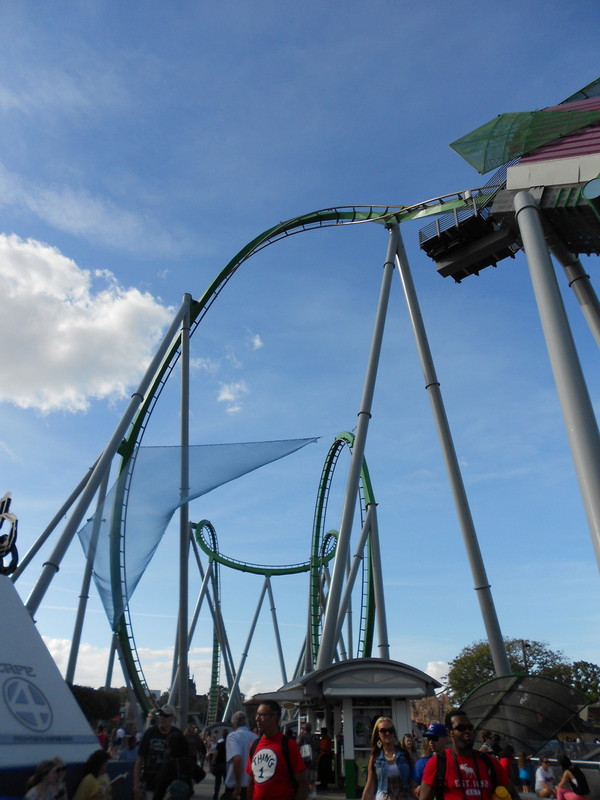 We had decided to start on the right side of the park where there were only a few rides we wanted to go on, then spend the rest of the day at Islands of Adventure, leaving Harry Potter World for another day (we had multi-day passes). Up next we walked over to an actual roller coaster. I took one look at it and said hell no. the whole way over they were trying to convince me that it was not that bad. I beg to differ: it starts with a vertical 90˚ incline and then upside down. I happily sat out, I finally had a chance to grab a late breakfast, alas I had to settle for a hotdog as the corndogs were all sold out (damn group of school kids nearby ate them all). The Transformers ride was new; Tasha & Greg said it was not there last time. There also happened to be no line-up for it. The guy told us it was the best ride in the park. If it was the same one as at Universal Studios in LA, then this guy was telling a blatant lie. The ride was as bad as in LA, except this time there was no wait at all. When we left, we were going to confront the liar… only he was gone! That trickster had disappeared! We got lucky again, there was no line-up at all for The Mummy. Herein I assumed it would also be the same as in LA, my expectations were set as such. Big mistake to assume so: the ride was not the same; it was much scarier, darker and had real fire. Needless to say I was screaming my head off on this roller coaster in the dark. My wrists hurt afterwards from gripping the safety bar so hard. We were confused when we got to the Men In Black ride. There was a short line-up but we were quickly ushered into a room wherein a lady said she would take us on a guided tour of an exhibit. We were ready to bail when the charade was busted, it was a cover-up! We were taken into an “elevator” and sent to secret training at the MIB headquarters. The ride was basically an alien shootout. We each had a laser gun and had to shoot aliens. We made it into a couple’s competition. Brent and I destroyed Tasha & Greg, Brent’s score alone destroyed there’s combined. Brent had come in first place, Tasha came in a close second and Greg was a distant last. Unless you count the lady sitting beside me, she had a lowly score of 1,000 (for comparison, mine was in the 70,000 range). The Simpsons ride was also the same as in LA so we skipped it. I demanded a stop at the Kwik-E-Mart for a giant Lard Lad donut. I have no idea why these donuts are so good, I doubt they are made fresh daily. 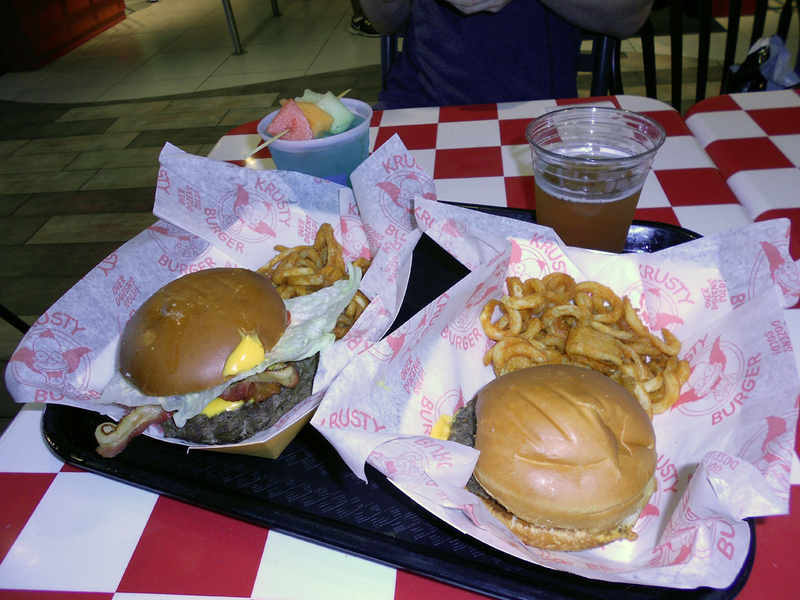 Lunch was had at Krusty Burger; it was a giddy thrill to order a Krusty Burger. While our burgers were being prepared Brent went next door to Moe’s to get us drinks (Duff beer and a Mr. Teeny for me). The server asked me where my “husband” had gone; I stared at him blankly for a second and realized he meant Brent. It made me feel old, even more so given this kid was no more than 14 years old, maybe 16 but no older. The Krusty Burger was surprisingly good given the cheese on it was nacho cheese (I am not sure if you can actually call it cheese) and it came with curly fries (the best format of fries). For dessert we had to eat the giant donut or else we would have to lug it with us on rides, not a good idea. Islands of Adventure was where all the good stuff was. Well, most of the good stuff. Brent & Greg started off with The Hulk. There was no way you could ever get me to ride it: you get shot out of a tunnel right into a twist that leads into an upside down loop. Tasha had given us fair warning that we were going on rides where we would get wet. I just assumed she meant like a little splash, like on a log ride. I would soon eat my words. The Dudley Do-Right ride appeared to be just that: a log ride. Everyone around was soaked, but I assumed that they had gone on it multiple times and were watching other people on it as well. Oh how wrong I was. There were people on bridges overhead who had paid to spray us with water guns. There are a few false drops on the ride, little small drops that basically caught me off guard (resulting in some funny yelps) and just splashing us, then came the final drop. I was not ready for how steep, fast and sharp it was. They also somehow engineered it so that you get soaked versus the usual splash from a log ride. We were drenched. Before heading over to the Popeye ride, I ran into a gift shop and asked for a plastic bag: my camera was at risk. The money I had in my pocket was now soggy and stuck together; I threw it in the bag and hoped it would be ok. Popeye’s was a boat ride, we sat in a circular pontoon and thankfully there was a waterproof storage in the middle. I tossed my shoes in. good thing I did, during the ride a lot of water had poured in through the open sides. At some point a water spigot sprayed water straight down on my head, resulting in peals of laughter from everyone else… that is until they got splashed or hit with a wave. Then it wasn’t as funny apparently. I was sitting backwards and so I could not see what was coming next, it was hard to avoid the waterfalls and sprays. The Jurassic Park ride was the same as in LA… except the splash at the end. Those damn splash engineers were at it again. We were completely drenched, whereas in LA it was just a light spray. With that we had cleared out most of what we had wanted to see. We had time to go check out Harry Potter World. We were assuming it would be busy; we had not waited in lines all day (except Despicable Me) therefore everyone was in Harry Potter world. While it was a little busier, it was not that tragic. The line at Hogwarts for the quiddich ride moved quickly. It was amazing to see how much effort h ad been put into constructing the Hogwarts castle from Harry Potter. It was the most detailed and interesting line-up queue I have ever been in. 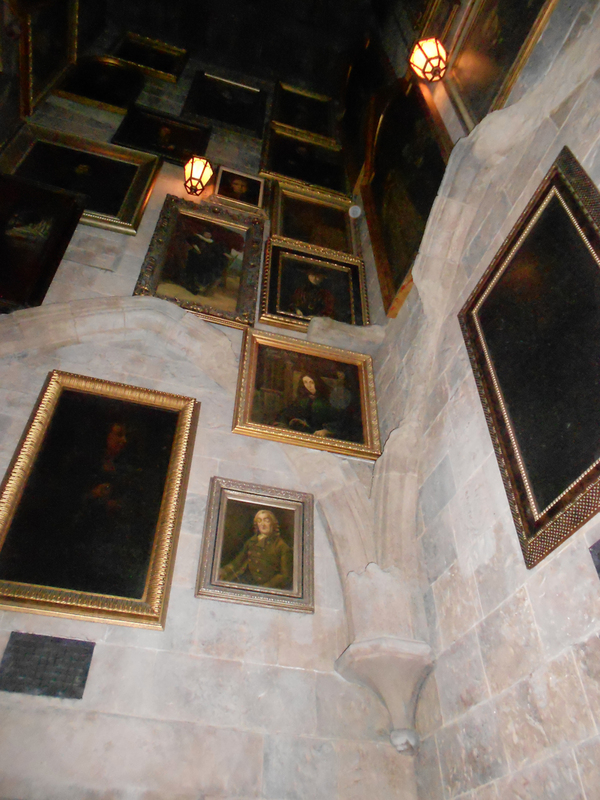 The hall of portraits was especially cool, as they were all (or most of them anyways) animated. The ride itself was partly 3D screens and partly a set. The ride moved along a track, switching between screens and real stuff. Then it did the unthinkable: it flipped us upside down. I yelled about it but did not scream. The story of the ride was really confusing. We were playing a game on a field, then a dragon chased us then we were back on the field, then we were racing through the castle? I was mad that I had been flipped upside down, not cool. 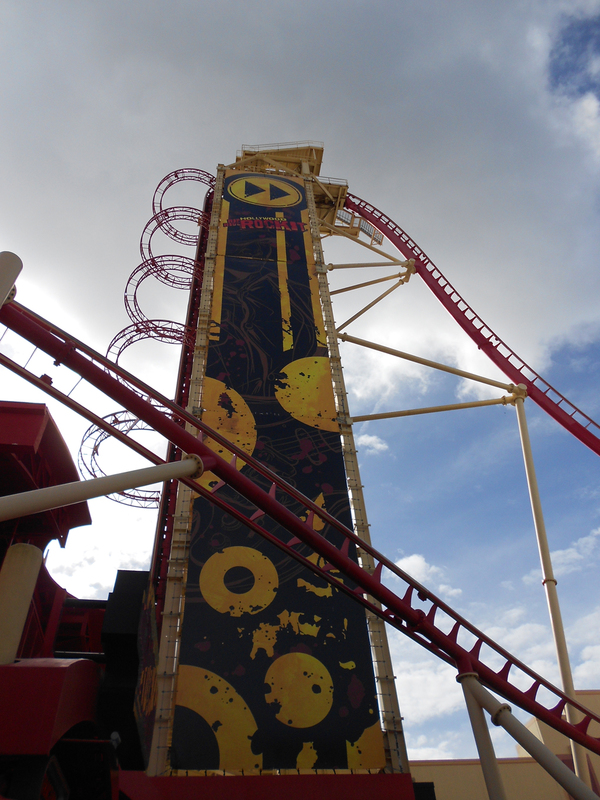 The next ride was a roller coaster wherein your feet dangled and you got flipped upside down: nope. Once again I acted as holder of hats while they went on the ride. I was not alone in my refusal. A mom walked by with her kid and tried to convince him to go on it, he refused, smart kid. I was happy just standing there, watching people drink butter beer which looked horribly disgusting. We passed through Dr Seuss Land on our way out to go on a really annoying ride. Tasha & Greg had mentioned how terribly annoying it was, we just had to go on it, to see for ourselves. It was a crappy little train ride, narrated with a Seuss story. The train passed above a cafeteria, the people down below waved at us. It wasn’t that annoying but I was tired, hungry and damp. On our way home we stopped at Target and the liquor store (Brent was in search of good Florida beer). I did not enjoy walking around Target in my damp clothes, it was uncomfortable. It was worth it though, I ended up finding my beloved Ben & Jerry’s Liz Lemon frozen Greek yogurt. We ended the night with a South Park marathon and a few rounds of euchre. Posted by kanysh on December 19, 2013 in Adventures of Pinka!